This is the 10th straight year that Sikhs wearing traditional turbans or scarves have graciously welcomed and fed veterans at a December session of Vet Connect, which each Tuesday provides a variety of services and materials to help people who served in the military. Indian cuisine is something Army veteran Joe LaFrance never tried before Tuesday, when he dug into a complimentary feast in Santa Rosa. 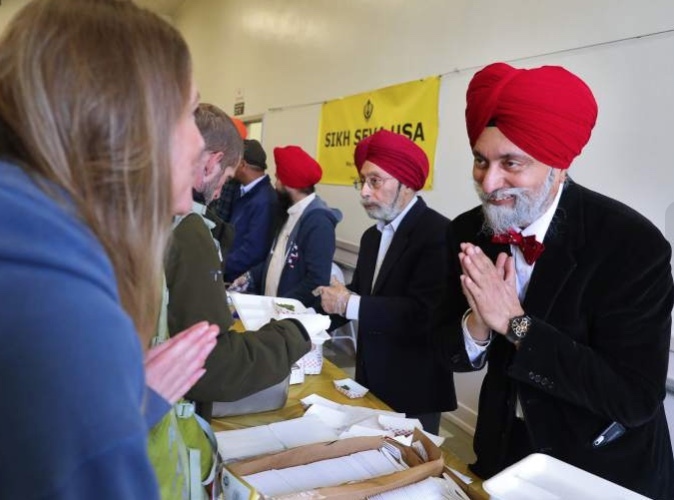 The buffet of chickpea-flour fritters, called pakora, with fresh mint sauce, and lentil soup, savory vegetables, yogurt, cumin rice, paratha flatbread, rice pudding and chai tea was prepared for military vets by members of the Sikh temple in Santa Rosa. It has LaFrance, who returned from numerous tours of duty with post traumatic stress disorder, looking forward to his next Indian meal. A leader of the annual luncheon is Dr. Mandeep Nagra, an internist who studied in Punjab, India, and practices at the Veterans Administration clinic in Santa Rosa. He said a fundamental belief of Sikhs motivates them to provide food to people in need: To feed a hungry mouth is to make a donation directly to God. **Totally awesome! Just made my day!